This card has always cracked me up because Steve Garvey appears to be making a cameo on his own card. The frame is practically absorbed by Wes Parker with Garvey peaking out of the shadow of Mr. Steady's right shoulder. Another quirk to this card is how much Wes Parker towers over Garvey. While part of it is perspective, I find it funny that the official listed height for Wes Parker was 6' 1", and Garvey's was 5' 10". Sure doesn't look like a 3-inch height discrepancy to me! Anyways, I do love this card because it is one of the first home run celebrations portrayed on a Topps card. Garvey is finishing his trot, while Parker is waiting with bat in hand to congratulate Popeye. I also like the lurking catcher at the left of the card with his shin guards peaking out. Is that orange I see...? Let's dissect this card to Name the Game! In 1972 Garvey hit nine home runs in 317 plate appearances. Since the Dodgers are in their road greys, those nine dingers are whittled down to four. One in Montreal, one in Pittsburgh and two in San Fransisco. Looking at the orange seats in left field, I could automatically knock off Montreal and Pittsburgh, but we'll do this scientifically. 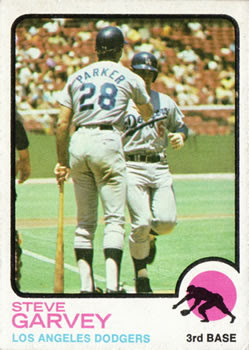 Of the four games noted, Wes Parker batted in the order behind Garvey in only one game, the July 1, 1972 meeting between the Los Angeles Dodgers and their dreaded rival San Fransisco Giants (The peaking orange shin guard tells all!). So, the featured card is the July 1, 1972 game between the Dodgers and Giants at Candlestick Park, and the play is Steve Garvey smacking a home run in the Top of the 1st off of Sam McDowell. Good stuff! I agree that is definitely in SF (I recognize Candlestick) but those shin guards have got to belong to the umpire rather than a cather, right?